Search queries on Google that draw a featured snippet response have almost tripled over the past two years, according to tracking data collected by Moz. When your webpage gets the nod from Google and ends up being selected for the Knowledge Graph (let's say), you get top-of-the-page organic placement and all the benefits that such a coveted position offers. The aim of this article is to demystify featured snippets, and to do so in nontechnical language. I'll talk about the types of featured snippets you can use and discuss how they work. After that, I'll guide you, step-by-step, on how to get started on claiming your spot at the top of the search engine results page (SERP). Note the Google search query in the screenshot (above). 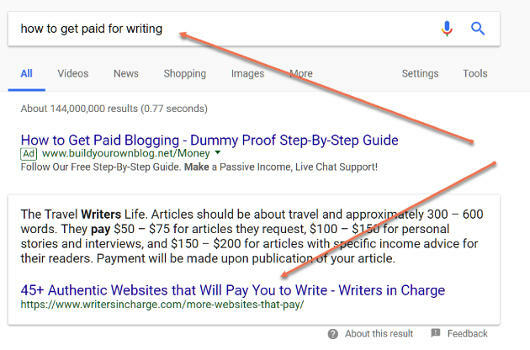 Right below the paid ad (taking up search position zero) is a featured snippet.